Hughes’ work looks at how parents talk to children in their early years and what this means for how children develop some of the most crucial skills of their lives. Since she began her academic career as an undergraduate in Cambridge 30 years ago, her focus has shifted from clinical groups, including children with autism, to studying social influences on two key psychological constructs – theory of mind and executive function. Psychologists use the term theory of mind, or mind reading, to describe awareness that other people have thoughts, feelings, intentions and desires. Most children develop theory of mind around the age of four. “Without it you can’t joke, you can’t lie, you can’t get sarcasm – the many social things that hinge on what others say and mean to say,” she says. As a result, theory of mind is pivotal to children’s ability to interact and form social relationships, but it doesn’t act alone. Along with theory of mind comes executive function – all those higher-order thinking skills such as planning, adapting plans when situations change and working memory. By following a group of 117 children from toddlerhood to adolescence, and developing a new battery of tests – including an innovative ‘silent film’ task based on Harold Lloyd’s 1923 comedy Safety Last!, developed with one of her former students, Dr Rory Devine – Hughes has been able to gain a deeper understanding of how family environments shape young children’s theory of mind. Her studies show that how parents talk to toddlers – in particular the extent to which they use words such as ‘think’, ‘believe’, ‘understand’ and other so-called ‘mental state talk’ – predicts how well children do at the silent film task when they reach the age of ten. Testing new interventions is also central to Ramchandani’s research, not least because as well as an academic he’s also a practising psychiatrist. “I come from a medical background where you want to learn stuff so that you can do something about it,” he says. He’s currently leading a randomised controlled trial with parents from London, Peterborough, Oxford and Hertfordshire to see if video feedback is a viable way of promoting positive child development. Over six sessions, parents are filmed playing with their toddler and the videos are then used to help parents notice – and respond appropriately to – their child’s communication. One of his long-standing areas of interest is the role fathers play in the lives of their young children, something he feels has often been overlooked. “There are obvious reasons for this – mothers are more often the primary carers and theories that have dominated psychology have revolved around the mother–child relationship – plus, over the past 30 years, most research on children’s relationships with parents has focused on mothers,” says Ramchandani. Before arriving in Cambridge in early 2018, he conducted the first major study of depression in fathers, which revealed that paternal – as well as maternal – depression has an impact on child outcomes. Since then, he’s studied the way fathers play with their babies and found that when fathers were more physically and emotionally engaged, children did better behaviourally and cognitively. “It’s striking to see how different fathers can have very different styles of interacting with their babies, even though they are very young, with some getting stuck in and leading the play, and others watching and following their child’s lead more”. Ramchandani is Director of Cambridge’s Centre for Research on Play in Education, Development and Learning, and with the team will be looking at an even wider field of play – studying its role in learning and social development, and finding the best way of measuring playfulness itself. 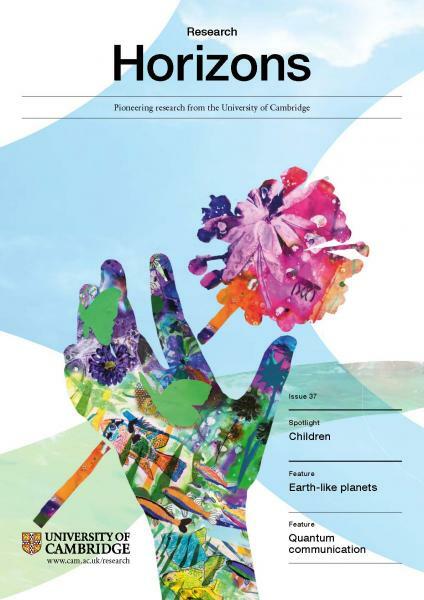 Inset image: read more about our research on the topic of children in the University's research magazine; download a pdf; view on Issuu.